Women face gender disparities in access to and control over land, as well as a lack of access to other productive resources and services. Legislation and policies, decentralized administrative and institutional capacities and public awareness campaigns need to assert, protect and enhance rural women's rights to land and property. Constraints to women's access to financial services (credit, savings and loans, insurance, etc.) include policy and legal barriers as well as cultural norms that prevent women from developing and growing enterprises, improving productivity, keeping bank accounts or entering into contracts without their husbands or another man. Women's lack of ownership over assets that can be used as collateral to leverage loans also constrains them more than men. To ensure women's improved access to, and benefit from both local and export markets, financial services that target women must be linked to a wider policy framework that ensures rural women's access to financial services and contributes to the development and expansion of markets and value chains. 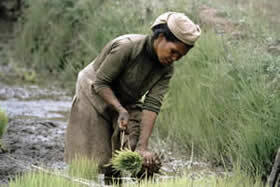 In the context of limited or nonexistent infrastructure, rural women spend an enormous amount of time and energy accessing water and fuel wood for domestic and agricultural use, preparing food, carrying produce and goods to and from markets on their own backs and caring for children. Rural infrastructure programmes can enhance women's participation and benefits – as workers during construction and as beneficiaries of the asset(s) created – yet women are seldom included in the design of such programmes. A number of Task Force member agencies focus on women's access to productive resources, assets, services, and infrastructure in rural areas. FAO assists governments in reformulating policies and programmes that enhance agricultural productivity by supporting women's participation and strengthening women's roles as rights holders and key actors in food security, sustainable agriculture and rural development. FAO enables governments to close gender gaps in agricultural productivity, food and nutrition security, rural livelihoods, natural resource management, including livestock, forestry and fisheries and post-harvest value addition. IFAD works with governments and other implementation partners to empower poor rural women and men through a wide variety of country programmes and projects to grow more food, better manage their land and other natural resources, learn new skills, start small businesses, build strong organizations and gain a voice in the decisions that affect their lives. Through its Purchase for Progress Initiative, WFP works with FAO and IFAD to locally procure food for emergency assistance and school feeding, in ways that support the economic empowerment of rural women farmers, while enhancing local and national food security. UNCTAD supports developing countries in the integration of gender considerations in their trade policy formulation and implementation, drawing attention, for instance, to the potential that high-value niche products in agriculture offer to rural women. UNDP supports efforts to strengthen governmental capacities and legal frameworks to guarantee women full legal rights to own property and to inherit as a critical issue for the economic empowerment of rural women. In Moldova, UN Women successfully piloted a "one window approach" to service delivery to rural women, bringing together service providers from agriculture, employment, social protection, cadastre, economics, small and medium enterprises and labour inspection to provide information and services in a coordinated manner. The model will be replicated in more countries.